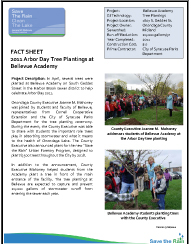 In April, several trees were planted at Bellevue Academy on South Geddes Street in the Harbor Brook sewer district to help celebrate Arbor Day 2011. 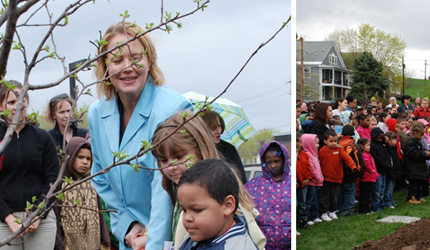 Onondaga County Executive Joanne M. Mahoney was joined by students and faculty of Bellevue, representatives from Cornell Cooperative Extension and the City of Syracuse Parks Department for the tree planting ceremony. During the event, the County Executive was able to share with students the important role trees play in absorbing stormwater and what it means to the health of Onondaga Lake. The County Executive also announced plans for the Save the Rain Urban Forestry Program. In addition to the announcement, County Executive Mahoney helped students from the Academy plant a tree in front of the main entrance of the facility. The tree plantings at Bellevue are expected to capture and prevent 20,000 gallons of stormwater runoff from entering the sewer each year.